With the promising emerging talent seen at recent international tournaments, there is hope for a brighter future for South African athletics. The outstanding and record breaking performances from juniors like Kyle Appel and Tlotliso Gift Leotlela - to mention a few - at the continental and international youth championships gives hope that South African athletics is moving in the right direction. There is a sense of optimism among coaches and stakeholders. Seventeen-year-old Leotlela, who won gold in the 100m and 200m at the Commonwealth Youth Games this year, is the South African 200m age-group record holder and a student at the TuksSport High School. Another Tuks athlete, Renate van Tonder, won gold at this year’s Commonwealth Youth Games with the second best jump ever by a South African in the youth age group. Taylon Bieldt, also from Pretoria, broke her own Africa record in the 100m at the same event. “So, I’m very excited about the future of athletics,” says Cornelius. “South African track and field athletics (junior and senior) has never been this good,” believes Lee-Roy Newton, MD of Newton Agencies, a sports marketing agency that represents, among others, a rising star like Kyle Appel. “It has been a rough ride for Athletics South Africa (ASA) the past couple of years, but judging by the athletes’s performances the past couple of weeks it seems the doom and gloom cloud is slowly lifting,” Annelize Jerling wrote in the Port Elizabeth sport newspaper ‘Hit the Road’ after the National Track and Field Championships in Stellenbosch earlier this year. These comments are in stark contrast to a decade ago when South African athletes failed to win a single medal at the 2005 and 2007 IAAF World Championships respectively. Then, coaches and stakeholders were despondent about the future of athletics. Several coaches and commentators lamented that talented athletes were abandoning the sport because they believed there was no future for them due to skewed selection policies, lack of support for athletics and athletes, when interviewed by Fanie Heyns for the article Can SA athletics win back athletes? 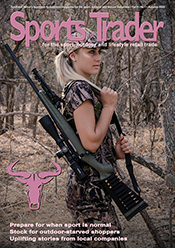 ( August/September 2010 issue). They also complained that there was hardly any media coverage of the sport. “This lack of representativeness in the SA team could have a negative impact on the levels of participation at school level, since there are no role models for aspiring black and coloured athletes,” Heyns concluded. “I do not know of any SA athletics icons my athletes emulate,” Marcel Otto, a top coach in the Western Province region was quoted as saying. Now, the impressive performance by exciting athletes like sprinter Anaso Jobodwana at this year’s IAAF World Championships should serve as an inspiration to aspiring athletes. Jobodwana won a bronze medal in 200m, but not only that, he also ran neck-to-neck with the world’s fastest man Usain Bolt and his rival Justin Gatlin from the US. Wayde van Niekerk is another exciting talent, who won the first gold medal for South Africa in 400m at this level in 95 years. His performance at the 2015 IAAF World Championships made him the fourth fastest person in the history and the fastest non-American. There are also many other promising juniors besides the two sprinters. Werner Visser returned from this year’s IAAF World Youth Championships with a gold medal in discus, which broke boundaries as this was South Africa’s first gold medal in this event in the history of the championship. Paul Botha also won gold in javelin at the same event. African record holder Sunette Viljoen, who has been excelling in javelin and winning medals for over ten years, should be excited to see that the future of javelin throwing is in good hands if Botha’s performance is anything to go by. Viljoen has been successful since she started competing and won her first gold medal at the Afro-Asian Games in 2003. She has since been a top contender in world athletics and has won medals at the IAAF World Championships (2011: bronze; 2015: bronze) and competed in the Olympics. In the past, not many medal winning youth athletes carried the same momentum into the senior level. Looking at the performances of South African youths at past World Championships and Commonwealth Games, it is evident that many youth athletes with promising futures vanished into thin air. Viljoen, and Caster Semenya are among the few athletes who managed to move from youth to senior level and still perform well. The current group of youth athletes has revived hope and excitement about the future of athletics. Management teams, agencies and coaches involved in the development of young athletes agree that the future looks bright. The good news for the industry is that they believe this will help grow athletics participation. “Athletics is not growing as fast as other sports, but with the current crop of world class athletes, more junior athletes should follow and continue being part of the code,” says Newton. With such performances, up-and-coming South African athletes do not have to draw inspiration from outside the country in search of role models. For retailers, inspired new participants might very well translate into increasing sales of athletics equipment. At the 2005 and 2007 IAAF World Championships South Africa failed to make the medal table. 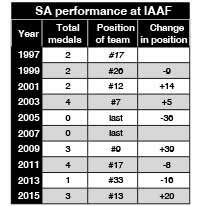 This was probably the lowest period for South African athletics, after we managed to reach the top ten in 2003. At the 2015 championship the gold and bronze medals our athletes won, propelled us to the 13th position. One of the differences between now and ten years ago is that the government is injecting a lot of money into developing young athletes that are still at school. In the Winning Nation programme, the spending focus is on the financial and non-financial support given to athletes and coaches. Young talented athletes identified at the Annual National School Sport Championships can receive the ministerial bursary that enables them to study at high performance institutes, sport schools and academies. SRSA has started with a programme to identify well-equipped schools in each province where these athletes could be nurtured. The cost of hosting the young athletes at these sport focus schools is annually covered by the Ministerial Sport Bursary, which includes both academic and sport support until they complete high school. Selected athletes progress to the high performance programmes run by SASCOC. These programmes are aimed at supporting talented athletes to be successful internationally. The department injected R41.6-m in 2015/16 into these projects. Over the medium term, SRSA is to transfer R27.8-m to SASCOC for supporting 60 elite athletes. Over the past few years the renewed focus on school sport has exposed more learners to athletics from a young age. The department of Sport and Recreation South Africa (SRSA) allocated R78.9-m for the National School Sport Championships, according to the department’s Annual Performance Plan 2015/2016. The number of school sport participants is expected to increase from 12 000 to 16 000, but this is linked to the growing number of sports codes included in each championship, not just growth in athletics. School sport leagues have five competition levels, namely intra-school level, inter-school level, district level, provincial level and national level. The department has made it clear that school sport remains a core deliverable for them in 2015/16. Athletics is amongst the federations identified as a priority for school sports by SRSA, and most schools participating in the leagues take part in athletics, SRSA told a briefing to the Parliamentary Committee on Sport and Recreation. The department’s aim is that every school in the country will eventually offer sport. Their target is that 6 400 schools will offer sport by 2018/19. Part of SRSA’s plan is to annually support at least one national school sport championship until 2018/19. SRSA is expecting a 10% annual growth in the number of learners supported by the provincial sport academy system by 2018/19. The Department of Basic Education (DBE) has engaged all its provincial and district offices in an effort to step up the implementation of sport in schools, according to a parliamentary briefing report. While the school sport programme will in the long run encourage more learners to participate in athletics, the current top performers are all products of high level programmes at universities. “About 99% of our athletic stars come from universities,” says Cornelius. A combination of good coaches and great facilities has allows TuksSport to produce great athletes, he believes. The institution has the right tools, hence their athletes have been performing well. The future of SA athletics is in the hands of a young group of high performers who are the products of good school sport programmes Wayde van Niekerk won the first gold medal for South Africa in 95 years in the 400m at the IAAF World Championship and ran the fastest time by a non-American in history. The 23-year was born in Kraaifontein, Cape Town, but then enjoyed the sporting facilities and coaching at Grey College in Bloemfontein. While studying marketing at the University of the Free State, head coach Tannie Ans Botha pushed him to achieve a historic performance. Anaso Jobodwana not only ran third behind Usain Bolt at the IAAF World Championships, but also broke the South African 200m record. After attending Selborne College in the Eastern Cape, the 23-year old got a scholarship to study at Jackson State University in the US, but he returned home because the university system in the US does not allow athletes to compete on the European circuit. Gift Leotlela: the world class training facilities at Tuks Sport have ensured that the 17-year old performs well at local and international competitions. The sprinter received a bursary to study at HTS Louis Botha high school, where many top Free State sprinters were trained. A Ministerial Bursary enables him to study at Tuks Sport School, where he has access to world class training facilities and coaching, which contributes to his success. “We have been lucky to receive talented kids with school bursaries,” says Danie Cornelius of Tuks Athletics. Kyle Appel: the 17-year old from Brackenfell High in the Western Cape had an impressive show at this year’s IAAF Youth World Championships and Commonwealth Youth Games. “Appel has the potential to become one of the best sprinters to ever represent South Africa on the global stage,” says Lee-Roy Newton, MD of Newton Sports Agency, which represents him and ensures that he receives the best guidance and support to ensure that he can concentrate on achieving his best performance. Renate van Tonder is another student from TuksAthletics who won gold in the girls long jump at this year’s Commonwealth Youth Games with the second best jump ever by a South African athlete in the Youth age group. Taylon Bieldt from Montana High in Pretoria also trains at TuksAthletics. She won gold in the 100m hurdles at this year’s Commonwealth Youth Games and also broke one of the oldest South African records. Werner Visser won South Africa’s first discus gold medal in the history of the IAAF World Youth Championships this year. The 18-year old also won a silver medal at this year’s Commonwealth Youth Games. Challenges facing athletics in the country are still there. Stakeholders emphasise that they do not see as much growth as they would like to see at school level in developing athletics participation. In some instances the athletics’ clubs outside of school have contributed positively in helping “these kids to become good athletes,” says Cornelius. The more people outside the school that are willing to help youngsters be better athletes the better the chances of producing more school level young talent, he says. As much as clubs outside the school play a critical role in the development of young talent, they are also faced with their own challenges. Throughout the school league period, the role of the sports club at each level will be to avail talent scouts to identify talented athletes and officials, as well as to mentor and support coaches. Athletes who do not progress to an elite level will have the chance of joining the club and continue to participate at a social level. Losing athletes to other careers and more lucrative sporting codes seems to be a continuing trend. “Some of our athletes go on to get into other professions after their careers are done,” Cornelius agrees. South Africa is also lacking behind in terms of financing coaches. “None of our (TuksSport) coaches get a salary that can sustain them. The money they get is only able to sustain them for small things,” explains Cornelius. We are very far behind compared to other countries in terms of providing more money for coaches and athletes, he adds. Lack of exposure to local competitions is another worrying factor to some. “The main challenge is that there is no local or national circuit for the current world class athletes to compete in,” adds Newton. Stakeholders agree that going forward the challenges in place should be addressed to ensure a stronger performance from our athletes. Appointing coaches on a full time basis and more financial support to the athletes is a call made by Cornelius. “The only way we can work together is to do a scientific research moving forward. We have the ability in our country and we need the support from other people. If we can do that we can be one of the best countries in the world in athletics,” he adds. SRSA’s 2015-2020 Strategic Plan includes, amongst others, a plan to fast track the development of sport and recreation, particularly in the rural areas. The department is set to continue to look at the viability of developing 52 regional sports complexes in the 52 districts defined by the Demarcation Board. SRSA’s plan is to develop young talented athletes by providing them with opportunities to excel. They will target emerging talents at sport focus schools, athletes not on Operation Excellence (OPEX) and world class athletes under 18 years of age. Promising young talent like Leotlela and Appel are a few examples of athletes to be expected to benefit from the department’s plan. New talent will be identified during the national school sport competition and a minimum of 40 athletes will be supported each year if they achieve the set performance criteria. The Ministerial Sports Bursary programme is potentially seen to benefit more athletes. More young people are encouraged to take part in athletics regardless of the ailing support at the school level. “We must, however, address the lack of and limited female participation at the elite level,” concludes Newton. Athletics: Can SA win back athletes?